Nest owners, rejoice! With the new Nest Temperature Sensor, your Nest can take (and use) a temperature reading from somewhere else in your home! This new sensor is a small, wireless, battery powered “puck” about 2″ in diameter. It can be used with the Nest Thermostat E and the Nest Learning Thermostat (3rd gen. only). It’s sold separately but available everywhere Nest products are sold (check it out here on nest.com and here on amazon.com). You can add up to 6 sensors per Nest thermostat, up to 18 total in a house. The idea isn’t new: competitor ecobee has bundled a combination room temperature and motion sensor with their flagship thermostats for a couple years now, a standout feature that helped make ecobee our top pick thermostat last year and this year. But this is a new addition to the Nest lineup, and we’re excited to see the Nest get such a great new feature! 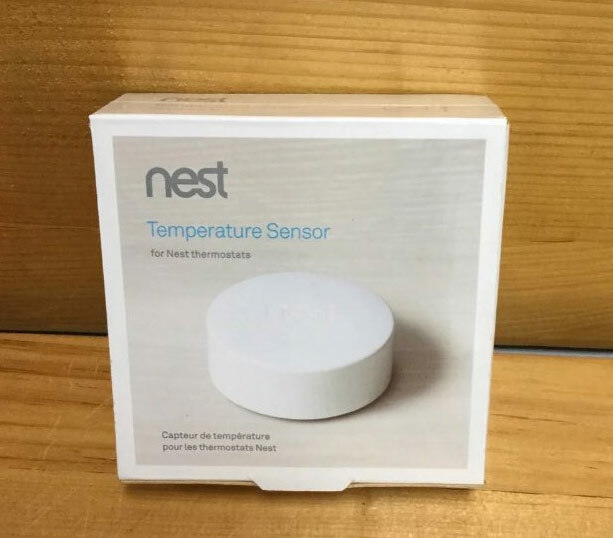 Who would benefit from the Nest Temperature Sensor? Basically, if you don’t like the temperature reading your Nest is getting wherever it’s currently located (too hot, too cold, etc. ), the sensor is for you. Place it in the room or area you really care about, and use its reading instead. It’s like moving your thermostat without having to actually, well, move your thermostat. Like any smart thermostat sensor system, the Nest Temperature Sensor is not a replacement for a dual-zone HVAC system. It’s not going to redirect heating or cooling, so if you hope to use the sensor to help make a perpetually-cold room warmer without roasting the rest of your house, just know that it’s not going to stop your HVAC system from also blasting more heat into all the other rooms, too. This seems like such a missed opportunity to us: Nest’s flagship thermostat uses sensors (as well as your phone’s location) to determine if you’re home or not. This feature is known as Home/Away Assist. But if your Nest thermostat is tucked away in a corner somewhere, it may never see you walk by and might decide you’re not home anymore. This is a common complaint we’ve seen from Nest users. This new sensor seemed like a no-brainer for enhancing Home/Away Assist, but Nest’s engineers left it out of this version. You might be imagining a scenario in which the Nest thermostat looks at all your attached sensors and, if any of them dips below a particular temperature, kicks on the heat. It doesn’t do this. It just looks at what temperature it should be reading for the given time of day and behaves accordingly. This seems like an obvious feature to include in a future update, though, and we’ve seen people asking for it on the Nest forums, so hopefully it will become a reality in a future update. Very few homes are the same temperature throughout. Your own home probably has a room that’s always colder or warmer than the rest. This variance is due to a variety of factors, such as exposure (north, east, etc. ), window size (and quality), the location of your thermostat, building materials, and your HVAC system itself. Normally, a thermostat gets your home’s temperature data from itself – wherever it might be located – but for homes with a lot of temperature variance, this might not be ideal. If you’re comparing Nest vs. Ecobee, the playing field just got a bit more level thanks to the addition of room sensors to the Nest lineup. Ecobee’s sensors have long been their unique and defining feature (now I suppose it might be the built-in Alexa on the Ecobee4), but they’re still ahead in that they detect motion whereas Nest’s do not. If you’re trying to decide between Nest and Ecobee, we still think Ecobee is tops. Ecobee’s flagship model, the ecobee4, has Alexa built right in for hands-off convenience and the room temperature sensor that ships with Ecobee is also capable of detecting motion (read our full review here). However, if you’re interested in Nest’s wider family of integrated products – such as the smoke/CO detector Nest Protect, Nest cameras, Hello doorbell, and others, then a Nest thermostat is an obvious choice made even better by the ability to pair sensors with a Nest thermostat.